EZH.TV logo — Old draft of logo for EZH.TV project, gameplay streaming service. 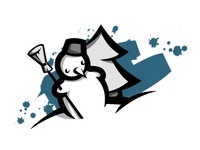 Snowman — Hi dribbble! Thanks to @Toloknova Ksenia for invite.